Submitting your website to both free and paid directory sites is a great way to increase the backlinks to your webpage. Directory sites are compilation sites that list links to all sorts of sites. To get a better feel for how these sites are structured, check out the open directory project at dmoz.org – it’s one of the best known directory sites on the internet today. Traditionally, directory sites are broken down into two different categories – free and paid – depending on whether or not they charge you to include your site in their listings. Both types can have a place in your search engine optimization campaign, depending on what type of budget you’re working with. However, whether paid or not, it’s important to realize that not all directories are equal in their potential to improve your site’s ranking. You’ll need to do your due diligence to be sure the directory you’re submitting your site to gives you the best return for your efforts. Getting your site listed in targeted directories that relate to the theme of your website will likely be seen as a premium by the search engines. In addition, you might even receive some traffic from them. For example, if someone who’s interested in dog training finds a great directory dedicated to gathering links in their area, they’ll likely bookmark the directory and come back time and time again. To find these highly targeted directories, search for “your niche +directory” using your favorite search engine. In addition to finding targeted directories for submitting your site to, you also want to look at the quality of the directory list. Submitting your site to directories with higher traffic and higher Page rank will lead to better SEO results for your webpages. Another important thing to check into before you submit your site to a directory (especially if you’re going to pay) is whether or not the directory makes use of “nofollow” attributes. Basically, these tags tell the search engine robots that any outgoing links on the directory page shouldn’t be considered in the search engine rankings. These tags were intended to prevent spam links from gaining popularity in the search engines, but if you submit your site to a directory that uses them, you’ll lose the backlink benefits of directory postings. If the directory doesn’t explicitly state whether or not it uses these tags, you can find out by looking in the code for rel=”nofollow” or by using a special plug-in for your browser that marks these links as red. When it comes to submitting your site to directories, you again have two different options. You can manually submit your site to each directory you’d like to be included in, or you can purchase software or services that will do the submissions for you. 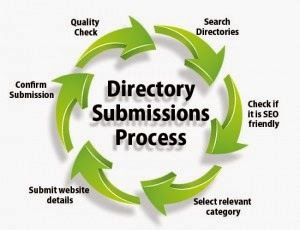 In fact, if you search for “directory submission” on any of the major search engines, you’ll see a number of different advertisements for bulk directory submission services. In most cases, these services won’t dramatically impact your site’s search engine optimization, since the directories they submit your site to may not be well optimized for your niche. Submitting your site to directories by hand is more time-consuming, but it may be worth the money saved if you’re only going to be including your page in a select few directories. And you can save your time altogether by outsourcing this task. Individual directories have their own rules for how a site should be submitted, but most include selecting the appropriate category for your link and including details like your link, anchor text and a brief description of your site. The amount of time it takes before your link is visible will also vary by directory. However, if you’re diligent in finding well-ranked, high-traffic directories, you should see increased traffic to your site in a short period of time.